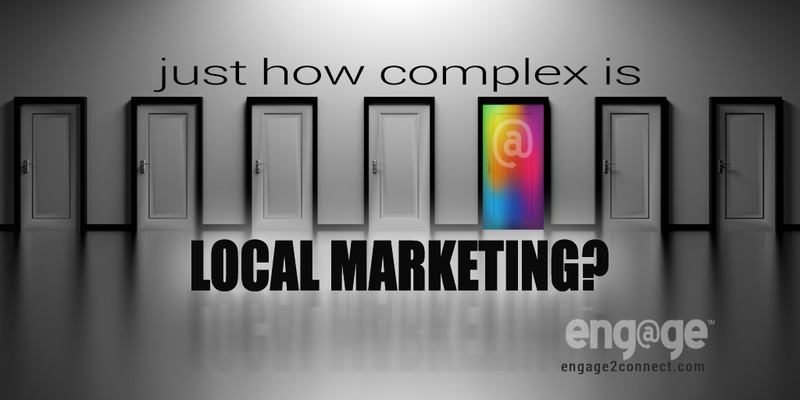 How Complex Is Local Marketing? Local marketing online has become a challenging list of details, tasks and ever-changing requirements that keep any marketing professional on their toes. For many local, small businesses it seems like it has become their second full-time job and second college career, all in one. And that’s not surprising. How difficult is it for a local business to be found on Google? Just a decade ago, a new small business could put up a do it yourself website and it would be easily found online with a simple search of the company name. That isn’t so easy anymore. In fact, there are so many specific requirements and hoops to jump through in order for Google to give a website a credible reason to appear in search. Most business owners don’t realize just how complex this process actually is. Why My Website Isn’t Found On Google? Whenever we are interviewing with a prospective client (yes, we interview them) about working together, we hear a similar story. We have built our website, done some SEO and have social media in place, but we are just not getting results and it is taking so much of our time. Sound familiar? The fact is that there are a number of details that have to be met for your business to show up on Google search. If we made a list of these specific details we would be looking at something exceeding two to three hundred required details that affect whether or not a website shows up on a Google search and if it does, what page it appears on. That’s no joke! We are going to put together a list of just a few of these Google requirements. Please understand that this list is not definitive in any way. The list is to help you understand how complex local marketing is and how time-consuming and resource intensive it is, let alone the expertise that is now required to make small business marketing online work. In this list, we are going to include some of the items that many small to mid-sized brands are not likely aware of. Though there are a lot of details that go with each item, we are going to keep the list short and simple. 1- Company Listing: Search engines want to be able to identify your company from multiple sites. This requires that wherever your brand is listed it is done exactly the same way. When we say exactly, we mean exactly! If your street name is SW Main Street, you need to have it listed exactly that way everywhere. Not S.W. one place and Main St. abbreviated in other places. EXACTLY the same way, everywhere you list your company. 2- Company Credibility: For a company and their website to be seen as credible, Google and other search engines need to be able to find it where it expects them to be. There are about 10 listing and directory sites that Google uses to identify and ascribe credibility to a company, its website and location. If each of these are not done and/or do not match exactly, you will have a difficult time being found. 3- Don’t Duplicate: We find that some of our new clients end up coming to us with multiple websites for their local company. Maybe they did a DIY website once, then hired their brother-in-law to build them a WordPress site (poorly) on another domain. Whatever the circumstances, Google does not like seeing a specific brand location with multiple domains, content and websites. 4- Content: Having a website is great, but if it doesn’t help your visitors, Google won’t like it either. Your website should have content (text, images and multimedia components) that answers visitors questions in a specific way. There has to be enough content that does this on every single page of your website. It’s both art and science. 5- Site Speed: Google recognizes that humans are becoming more and more distracted. Simply having to wait more that a split second for a web page to load is enough to make your site not worthy. Your website pages must load in less than 2 seconds if you are going to easily be found in search. This is a complex task that incorporates tools, software, design functions and many other details. 6- Mobile Compatible: Google has transitioned their index to something they call mobile first. This means that since consumers are now conduct more searches from smartphones and mobile devices rather than laptops and desktop PC’s, sites that are designed specifically for a mobile experience receive preference. Not just a little preference, but a huge preference, even if the search is being done on a PC. 7- Customer Validation: Not only does your business need to make sure that they have a Google My Business or Google Maps page setup, but you also need to have validation of your business from customers. Brands that have many reviews on both Google and other review sites will inevitably rank higher in search results than other companies who do not. So the quantity and a quality of the online review rankings are directly associated with the validity of your company website. 8- Bounce Rate: The bounce rate of your website site is the percentage of people who come to your site and leave without clicking to see other pages within your site. If your website is a do it yourself version that isn’t setup with user experience in mind and designed in a way that “funnels” people to the next part of your story, your bounce rate will be very high and effect your traffic from search. Are you feeling overwhelmed yet? Many of our clients were when they began to understand what we have written about here. But wait, there’s more! We have largely focused on the search elements of local business marketing in this article, but just as search has some 200-300 details, so does social media, content creation, landing pages, search ads, social media ads, email marketing and, and, and. The fact is that most business owners started their business because of their expertise and passion for a specific product or service, not because they wanted to go back to school to learn marketing, or have yet another full-time job doing marketing. That’s where we come in. How can we help you?